Every year, thousands of fundraisers raise huge amounts of money for hundreds of charities by applying to do the London Marathon. This year, Khushi Feet have an entry! Mark Grainger (from Teynham, near Faversham) has taken up the challenge and is training extremely hard for the 26 mile run which will take place on Sunday 26th April 2015. Mark is a great supporter of Khushi Feet. He says: “I got involved with the Bollywood dance event (in 2013) and was just inspired by Emily really and her commitment. I don’t want to sound cheesy, but there’re some people that don’t really have anything. 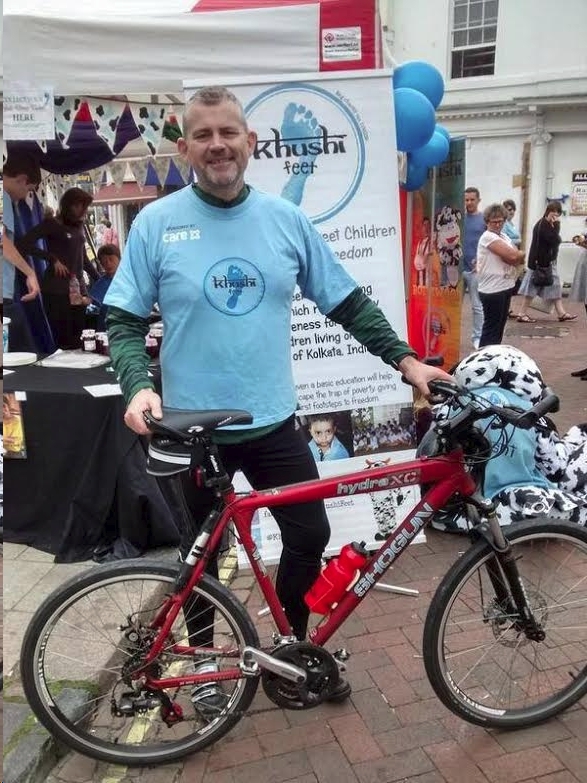 So I think we should all try and do our bit.” We are very grateful to Mark for what he’s doing to support Khushi Feet. We want to get behind him as much as we can. Let’s make every hour of his training worthwhile and help him reach his fundraising target of £2,000. How ever much you can sponsor will make a difference to the lives of street children in Kolkata. Just £1 will feed a child at the street schools for a whole week. Keep up to date with Mark’s training progress by following him on Twitter @Mark_HJGrainger. Tweet him some encouragement using #TeynhamTortoise.